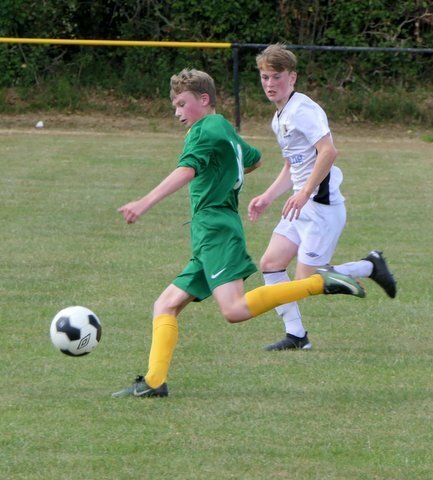 A scorching second half performance, boosted by goals from Cian and Eoghan Byrne, saw the Carlow Kilkenny under-15s pick up their second SSE Airtricity League of Ireland win in a week. A sun-baked Derdimus was the venue as the local side scored some South-East pride, coming from a goal down to beat an impressive Waterford FC. Having come from two down to beat Cobh Ramblers 3-2 in Cork last weekend, Mark Ross’s side were at it again as they battled back to beat Waterford, a result which sees them leapfrog their rivals in the league table. Carlow Kilkenny showed promising signs with some good link-up play in the early stages, but it was Waterford who went closest to breaking the deadlock. The visitors should have gone in front when Mzee Isaac Boston lost his marker and got on the end of Jamie Lee’s 14th minute corner but he couldn’t keep his close-range header from flying over the bar. That was a real let-off for the home side, who hit back with a spell of sustained pressure. With Niall Rowe leading the charge they worked the ball around the Waterford box, eventually winning a corner. However, disaster struck when a lightning-fast counter-attack saw Waterford go in front. Carlow Kilkenny were rocked but fought hard to get back on level terms. A counter-attacking move of their own almost paved the way to parity, as Eamon Lalor and Eoghan Byrne combined to send Cian Byrne scampering away down the right, but goalkeeper Conor Cummins did well to block the 30th minute shot. Waterford could have doubled their lead soon after when the home side failed to clear a Kervick corner, but Boston’s volley flashed over the bar. Raising their game, it took Carlow Kilkenny just eight second half minutes to blasted their way back on to level terms. Skipper Fionn McCaffrey was the provider, clipping a clever diagonal ball over the Waterford defence. Cian Byrne did the rest, ghosting in off the shoulder of the last defender before unleashing a stunning volley that screamed into the net. The game was set up for a dramatic ending, with the drama increasing after both sides were reduced to 10 men, Adam McCarron and Jack Deegan seeing red for an off-the-ball incident. Carlow Kilkenny got to grips with the situation, grabbing what proved to be the winner 16 minutes from time. Eamon Lalor thought he had scored when he volleyed a Rory O’Dowd corner at goal, but the ball cannoned back off the post. Eoghan Byrne pounced, staying calm to ram the rebound home through a packed box. Waterford didn’t give up – Carlow Kilkenny were thankful to defender Darren Lawlor for a vital tackle late on, and a superb save from sub goalkeeper Josh Coady to keep out Lakou Oki’s menacing header, but a spirited and strong defensive display saw them withstand the Blues pressure and secure all three points. Carlow Kilkenny will hope to continue their good run when they travel to Mounthawk Park next Saturday to take on Kerry FC. Carlow Kilkenny FC: Ben Goodwin; Jack Haughney, Fionn McCaffrey, Adam McCarron, Darren Lawlor; Eamon Lalor, Niall Rowe, Rory O’Dowd, Jack O’Neill; Eoghan Byrne, Jamie Murphy. Subs: Cian Byrne, David Olubuwale, Josh Coady. Waterford FC: Conor Cummins; Jamie Lee, Jack Deegan, Ciaran Hodanu, Lakou Oki; Mzee Isaac Boston, Michael Quinlan, Eoin O’Brien; Salim Ahmed, Aaron Roche, Liam Kervick. Subs: Darragh Queally, Charlie Binnions, Scott Delahunty, Dean Larkin, Abel Alabi. Referee: David Connolly. Assistants: Tristan Eardley, Jason Moore.